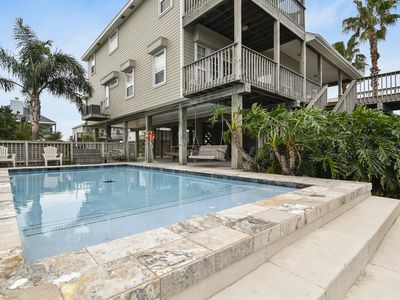 Dog-friendly oceanview home w/ plenty of room & easy access to fun attractions! 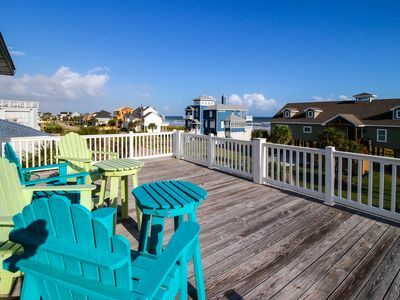 Your next family reunions and work retreats are looking better already! 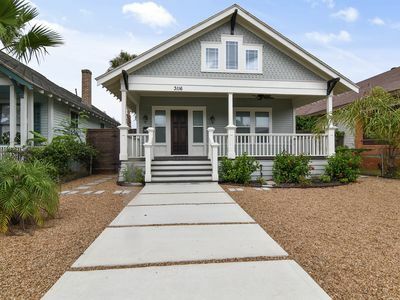 This Texan home has all the space you need, with accommodations for small dogs and easy access to the sights, sounds, and especially the sandy beaches of Galveston Island. 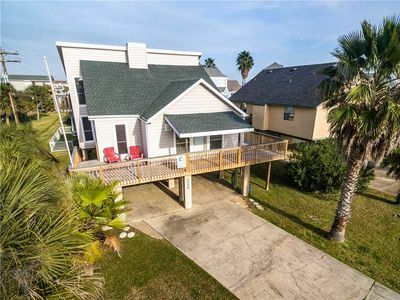 Just 16 miles southwest of Galveston proper, you’re just a few steps from the sea, which you can admire from the shaded patio and two spacious decks of your home. 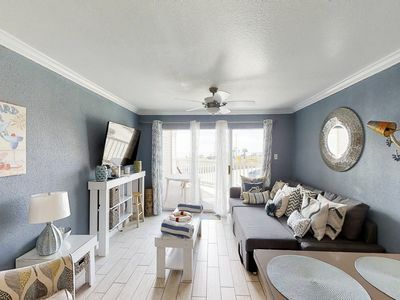 Windows let in natural light, which goes well with the bright, vibrant decor. 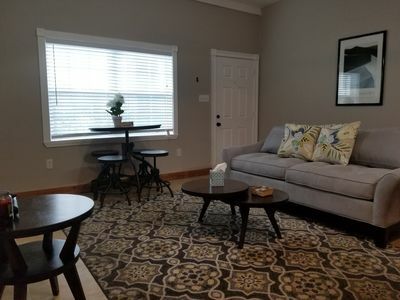 Enjoy it all from the family room, featuring plush furnishings for everyone to enjoy cable and the home’s DVD library on the nearby flatscreen TV above the decorative fireplace! The kitchen is just nearby, with all the basic appliances you need to whip up a massive feast for your group. Four guests can nibble on snacks at the granite breakfast bar, while others can take their seats and savor some meals at the plentiful indoor and outdoor tables. Once you’re done, just load the dishwasher for quick, easy cleanup. 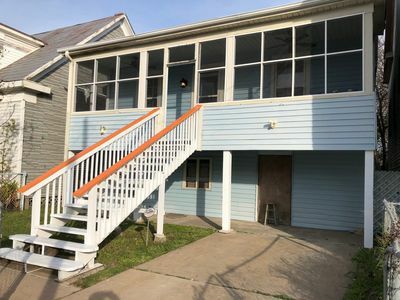 Fourteen guests at once can use this home’s four bedrooms and living room sleeper sofa (and two dogs under 25 pounds, for a small nightly fee). 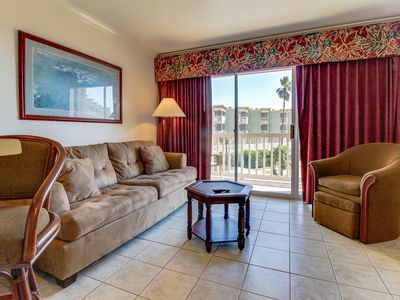 Each floor has its own master suite, featuring king-size beds, ocean views, and deck access. 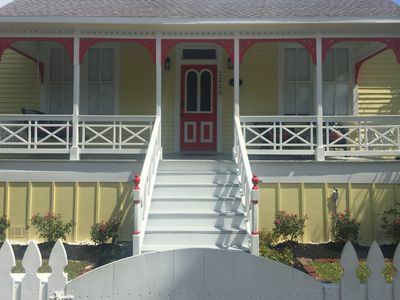 The third bedroom has two queen-size beds and a full-side rollaway, with kids more than welcome in the two twin-size beds in the final bedroom. 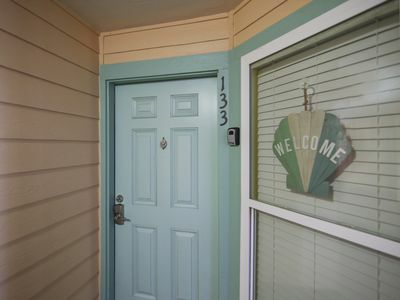 Freshen up in the half bath, take a long shower in one of the three full bathrooms, and start a load of laundry in the private washer/dryer. As you wait for your clothes, you can use the WiFi to plan something fun - you’ve got a wide variety of choices! 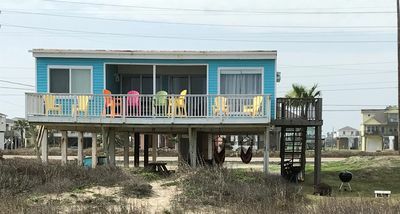 Galveston’s amusement parks like Moody Gardens and Schlitterbahn are just 16 miles away, and there are plenty of detours to try on the way there and back. 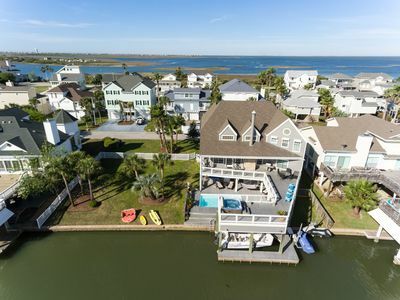 Jamaica Beach is an amazing neighborhood with scenic canals to admire, while Galveston Island State Park lets you go fishing, beachcombing, and more! Book today and prepare for a fantastic Texan getaway! Parking Notes: This home has parking for up to 4 vehicles in the double driveway. Do not park on the grass or in the street. If overflow of vehicles is spotted during the Local Operations Manager's random drive by this will be a violation of agreement. 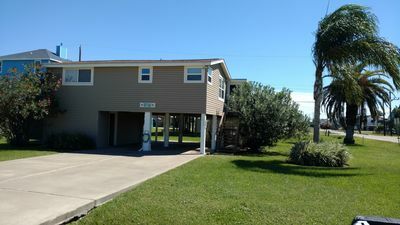 Water Access: This second row beach home has a direct dune entry across the street from the front of the home. This access is public for all to use. It is a short 1-2 minute walk. There is no driving on this beach. 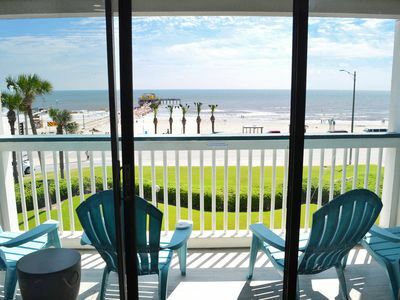 Diamond Beach 216, 2/2 sleeps 6, lazy river in the resort. 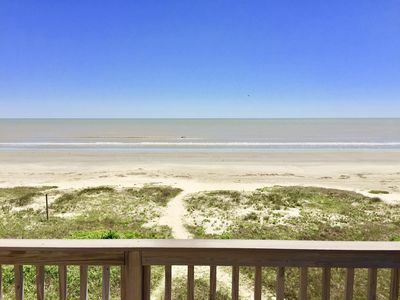 The BEST Gulf Views! 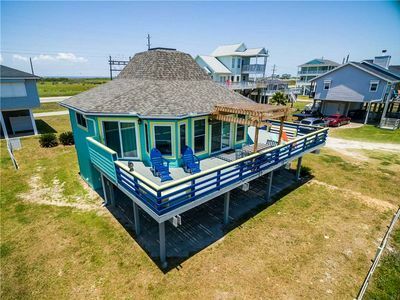 Fabulous Historic Beach Cottage! 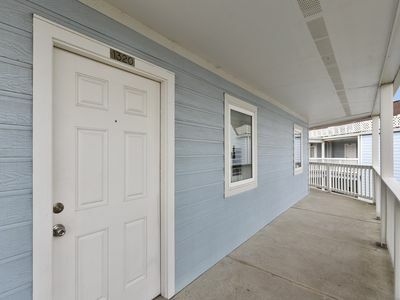 Beaches and Seawall 1 Block! Bicycle To Strand! Sol of the Sea-Your own Private Pool on a canal. 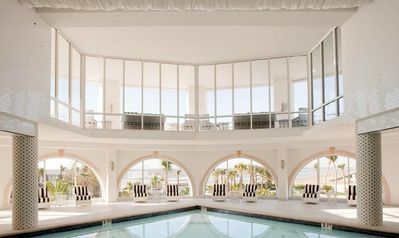 Eat, fish, swim - have fun at the Sol of the Sea! Palm Tree Pool Paradise in Pirates Cove - Firepit, Hot tub, Kayaks! 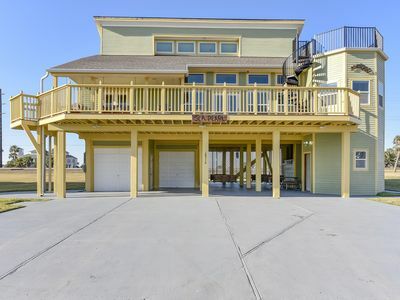 Indian Beach Sea Pearl is a 2nd row beach home, 6 bedrooms will accommodate up to 19 guests! 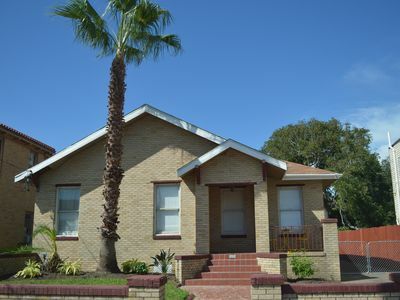 Enjoy everything Galveston has to offer here.